A large, dark hornbill. this bird walks and forages on the ground most of the time, although it roosts in trees. It lives in groups of up to eight birds, that share and defend a territory. Groups patrol their territories, probing, peeking, and digging at the ground, and eating small animals including insects, snakes, tortoises, and rodents. Some members of the group act as "helpers" for the dominant pair when they nest. • NliST A hole in a tree, lined with dry leaves. 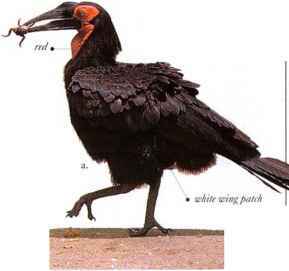 • distribution Parts of Africa sou th of the Sahar > Remark This is the largest species of hornbill. 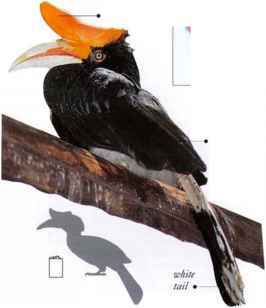 One of the larger hornbills, this species has a huge casque extending along most of the bill and curving upward at the end. A bird of lowland and foothill forest, it prefers the tops of high trees in areas of mature growth. In spite of its size, it moves easily among the branches with large, springy hops. It (lies strongly above the trees with noisy, flapping wingbeats, frequently uttering its resonant, trumpeting call. The wings are broad and black, and in flight the white rump and white tail with a black band are revealed. Usually occurring singly or in pairs, it gathers in small parties where fruiting trees otTer an abundant food source. Although fruit forms the main part of its diet, small birds and nestlings are sometimes taken, and also other small creatures. • NEST A hole in a tree, the entrance plastered over to leave only a narrow slit for feeding. Peninsula. Sumatra. Borneo, and Java.